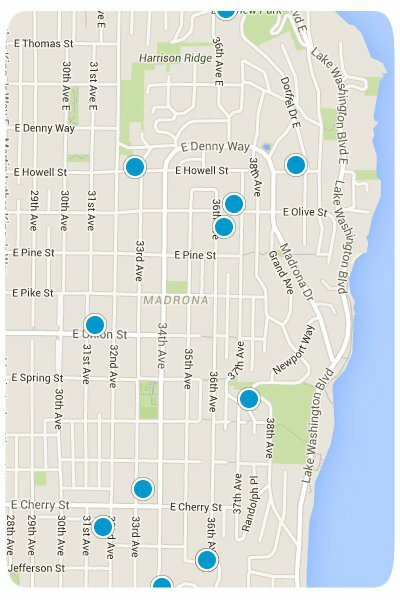 SearchHomesNW | Seattle-Madrona Real Estate-Easily search the MLS for all Madrona homes and condos for sale. Located along the shores of Lake Washington, situated roughly between the I-90 and Highway 520, Madrona is a community of diverse culture, people and amenities. Living in a neighborhood such as Madrona is a real treat; the homes are a mix of mid-century, contemporary, brick and bungalow styles with housing values much higher than the Seattle average. This is mainly due to the affluence of the eastern side of Madrona. Many of the homes are valued at $500,000 and above with some even eclipsing the $1 million mark. The homes are situated along many winding roads that go up the slope of the hill on your way to Downtown Seattle. This neighborhood is noted for being the home to a few celebrities, most notably former Nirvana front man Kurt Cobain. Blooming parks and gardens make a stroll through the community pleasant during all the seasons. Madrona Park comes complete with a snack bar, picnic tables and covered shelters that can be reserved through the public parks system. A bathhouse, which doubles as the home to a dance company offers year-round classes. There is a full-service swimming beach complete with lifeguards, roped-in swimming area, floating docks and facilities. Madrona carries a slower pace of life possibly brought on by its “out of the way” location on the lake. Madrona has a small but growing business strip on 34th which includes an array of restaurants, shops, cafes, a local winery and a renovated yellow-stucco gas station (now a frame shop and gallery). The east-central location of Madrona requires more non-arterial commuting. Reaching the I-5 is easily accomplished by taking Cherry Street, which turns into James Street. Finding the on-ramp is just a matter of turning Northwest onto 7th Ave. Driving to the east side of Lake Washington involves a few minutes of steering southwest towards Rainier Avenue. Continuing south on Rainier Avenue will lead to Renton. Here the road turns into Highway 167, making Interstate 405 accessible for a journey to Bellevue and Kirkland. When in Madrona, be sure to stop by the Hi-Spot Café, grab a latte and take in the park and waterfront, which comprise of much of Madrona’s fingerprint. Homes for sale in Madrona vary: there are Condos For Sale In Madrona, Town-Homes For Sale In Madrona, and Single-Family Homes For Sale In Madrona. There are also many New Homes For Sale In Madrona and many under construction. Thank you for using SearchHomesNW.com to find 30% more listings than Zillow, Trulia, and Realtor.